Red Indian Paintbrush clings to a sandstone crack atop windswept Yellow Rock. Just west of Cottonwood Creek in the Grand Staircase-Escalante National Monument, great lumps of Navajo sandstone lie jumbled on top of each other. 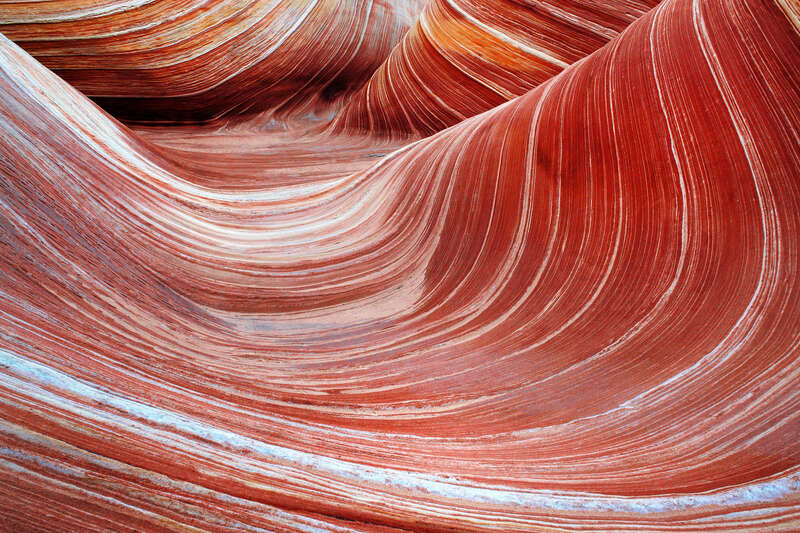 Although Navajo sandstone is predominantly white, yellow and red can result from minerals like limonite (yellow) and hematite (red) left between the grains of sand by groundwater millions of years ago. One of these giant, candy-swirled slabs serves as a great day-hike destination along Cottonwood Canyon Road. Yellow Rock is a cross-bedded sandstone dome almost completely devoid of vegetation. Although it’s not one of the highest points in the region, the summit is tall enough to provide sweeping vistas of the surrounding landscape. And what a landscape it is. The far-reaching views certainly worthwhile, but the main attraction is the amazing diversity of hues in Yellow Rock itself. Yellow is the predominant color, but currents of red, pink, and white combine with the cross-bedded ridges to create a tapestry of pattern and color. Beyond the summit of Yellow Rock, deep canyons and jagged pinnacles unfold into the distance. Castle Rock dominates the northerly view. Hackberry Creek lies hidden in a deep canyon immediately to the north. Although the hike traverses a relatively short distance, it includes steep switchbacks and long slickrock segments marked only with periodic cairns. Don’t forget to turn around and survey the broad sweep of Cottonwood Canyon and the Cockscomb on the way up. Although the hike can be completed in as little as 3 hours, a full day could easily be spent exploring the area. The trip can also be lengthened by including Red Top and Hidden Cache. 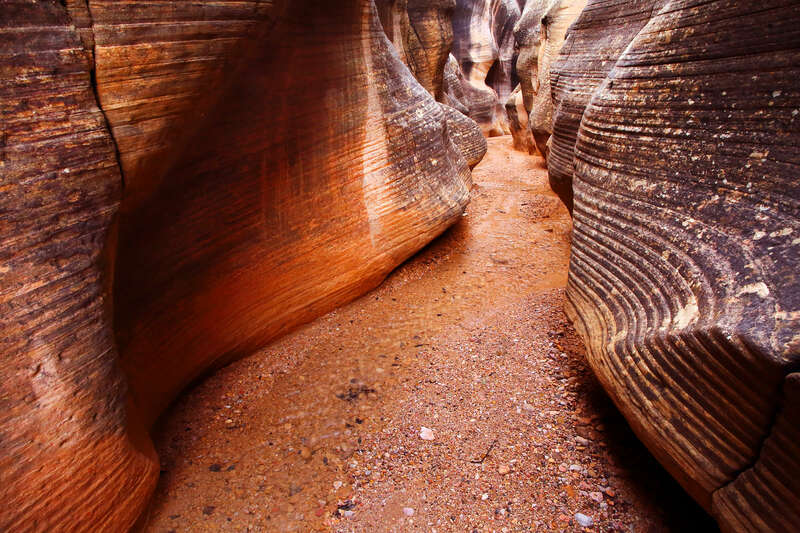 Yellow Rock has become a significantly more popular destination since appearing in Michael Kelsey’s book, Hiking and Exploring the Paria River. Now it isn’t uncommon to see a dozen people visiting per day during peak hiking season. 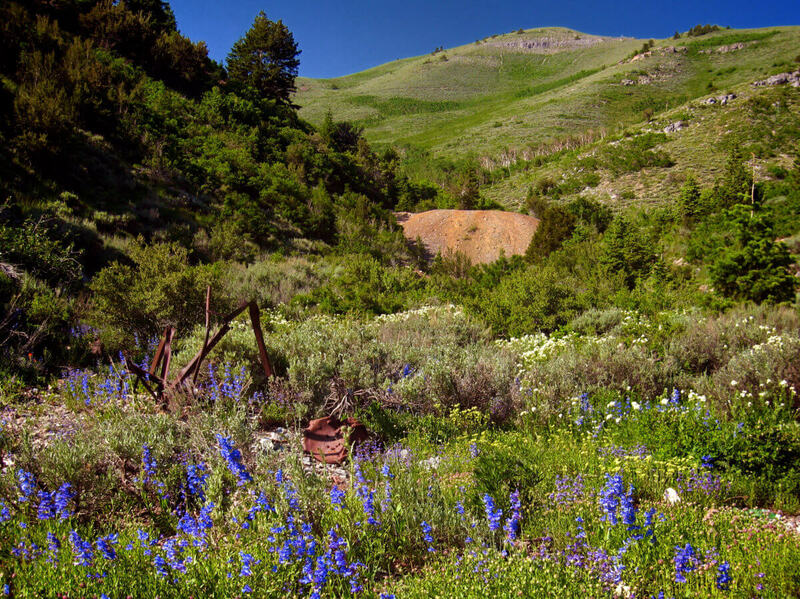 Sign in at the trailhead register and locate a beaten path that heads downhill to Cottonwood Creek. An obvious trail heads west to the mouth of Lower Hackberry Canyon. To reach yellow rock, head south along the west side of Cottonwood Creek instead. Follow the creek bottom for about 300 or 400 yards. Look for another wash joining from the steep slopes to the west. Follow the bottom of this wash for a short distance to the west, and look for a small footpath. After 100 yards or less, this trail will bear north and begin climbing a very steep slope of loose rocks and dirt. Follow these switchbacks for a quarter of a mile to a ridge. Follow the ridge uphill for another 100 yards to a saddle that separates Hackberry Wash to the north from our small side canyon to the south. This spot affords remarkable views of Cottonwood Canyon road and the Cockscomb. From this saddle, the trail heads up the ridge to the west, past a few jagged rock formations, and over a combination of slickrock and sand-dunes. Soon, the unmistakeable Yellow Rock will enter your view. There is no trail to the summit, but the whole eastern and southern slopes are broad and shallow. The north and west slopes are significantly steeper. The summit of Yellow Rock broad and flat, but the highest point is found on the west end of the dome. 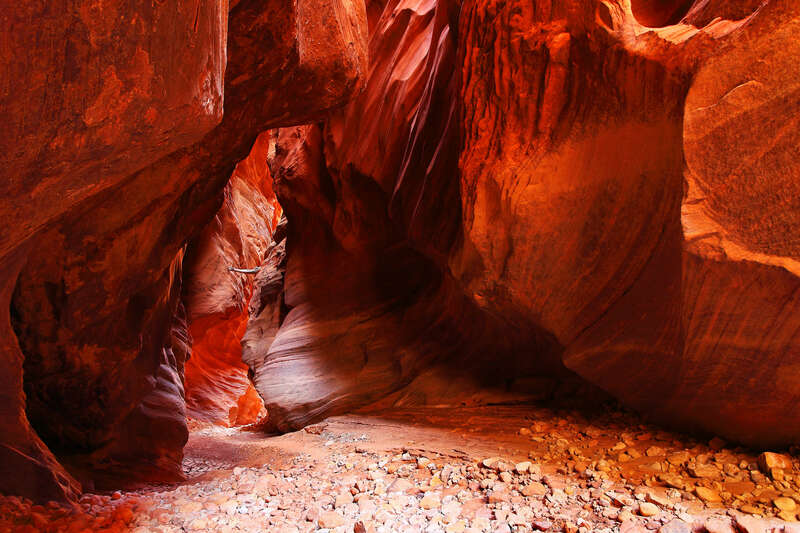 The northwest slopes are steeper, uneven, and exhibit less color variation; the most colorful areas are the south and east slopes, where the sandstone is smoother and variegated with shades of yellow, red, and white. From Kanab, drive east on Highway 89. After crossing the Paria River, the BLM Paria Contact and Information Center will be on the right. Three miles east of the BLM Center, Cottonwood Road heads north from Highway 89. The road is well-marked. The parking area for Hackberry Canyon is on the west side of the road, 14.4 miles from Highway 89. This serves as the trailhead for both Lower Hackberry Canyon and Yellow Rock. Road conditions can vary significantly. Often it is well-graded and dry. Sometimes it can be quite washboarded. The roadbed is made of deep, dusty clay and is impassable when wet.